Donald Trump’s poor popularity has affected the level of trust Australians have in the US, but not their level of faith in the alliance. Fewer Australians are trusting the US to act responsibly in the world, and they have scant regard for Donald Trump – but this is not translating into people losing faith in the American alliance, according to the Lowy Institute’s 2017 poll. Only 20% have a “a great deal” of trust to act responsibly in the world. This is a big fall from the 40% level in 2011, when the question was last asked. Overall, 61% trust the US to act responsibly, 22 points lower than 2011. The contrast is stark when attitudes to other countries are compared – 90% trust Britain and 86% trust Germany and Japan. China is trusted by 54%. The poll found that 60% of Australians say Trump causes them to have an unfavourable opinion of the US, with younger adults and women being especially likely to be unimpressed. Still, this figure is lower than the proportion who said this about George W Bush in 2007. Despite people’s feelings about Trump, support for the alliance has actually increased six points since 2016 – 77% say it is “very or fairly important” for Australia’s security. Just 29% believed “Australia should distance itself from the United States under President Donald Trump”. 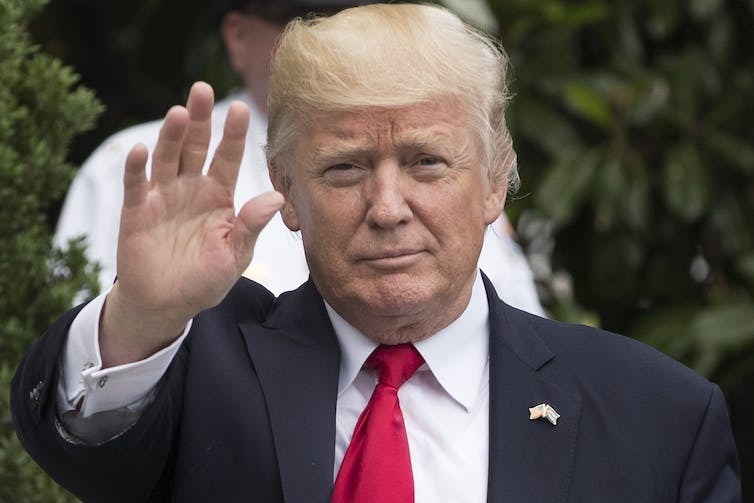 The institute’s executive director, Michael Fullilove, said that while Australians had come to terms with the Trump presidency, the relationship was not unaffected by him. “The president is not popular in Australia. And Australia’s trust in the United States to act responsibly has declined”. The survey of 1200 people was conducted in March. The release of the results comes a week after Malcolm Turnbull’s parody of Trump at the federal press gallery’s Midwinter Ball. So far there has been no response from Trump. The poll found considerable suspicion of China, mixed with strong pragmatism. Some 46% believe it is likely China “will become a military threat to Australia in the next 20 years”. But 79% see China as more of an economic partner than a military threat. Only one-third (34%) would favour using Australian military forces “if China initiated a military conflict with one of its neighbours over disputed islands or territories”. But 68% favour Australia conducting “maritime operations designed to ensure freedom of navigation in the region”. Nearly eight in ten people (79%) are dissatisfied with the direction of the world, but despite the international rise in protectionist and nationalist sentiments, 78% believe globalisation is “mostly good” for Australia. When former prime minister Paul Keating said last year it was time to “cut the tag” and loosen the bonds of the Australia’s alliance with the US, who would have thought the man wielding the knife would be Donald Trump? The public disagreement between the Trump White House and the Turnbull government over the deal to send asylum seekers languishing on Manus Island and Nauru to the US is unprecedented. At no previous time in the history of the Australia-US alliance have things seemed so dire – and got there so quickly. Australian and American leaders over the years have, from time to time, disagreed or said things to cause embarrassment. But for the most part, such disagreements have been kept out of the limelight. John Howard and Bill Clinton did not like one another. Their discomfort did not, however, seriously affect the alliance. But sometimes discomfort breaks into something stronger. Blanche D’Alpuget, Bob Hawke’s then-biographer (and later his wife), recounts that Australia’s former foreign minister, Bill Hayden, and US Secretary of State George Shultz loathed one another. Hayden referred to Shultz as “the German pork butcher”, while Shultz called Hayden “stupid” to his face. But, unlike the current saga, the Hayden-Shultz spat did not become public until after D’Alpuget published her Hawke biography. In 2008, the content of another phone conversation between Australian and US leaders became pubic. A brief row broke out when reports emerged of a leaked conversation between Kevin Rudd and George Bush. The White House angrily rejected the public version of events. Australia is a very important and central ally and it’s going to continue to be. Before the president shows such disrespect again, he should consider this: there is only one nation that has stood with us in every war of the last century, from the fields of France and Belgium to the mountains of Afghanistan – Australia. Trump has handled this situation very badly. In a very short space of time he has undone decades of work in building trans-Pacific security ties between Australia and the US. Other American allies – Japan and South Korea in particular – must look on, aghast at what has transpired. But the Australia-US alliance was already under pressure before the phone call between Trump and Malcolm Turnbull went awry. The Trans-Pacific Partnership (TPP), a vital element in the Obama pivot to Asia, was headed for the dustbin even before the US election. Within hours of being sworn in, Trump cancelled US involvement in the trade deal. More ominously, other US security partnerships in the region exhibit severe strain. In an eerie and intemperate foreshadowing of Trump’s outburst, Philippine President Duterte in 2016 called Barack Obama a “son of a whore” and then denounced his country’s security alliance with the US and embraced the Chinese. While many aspects of the US-Philippine relationship are still in place, it is nonetheless showing signs of strain. The Australia-US relationship has suffered numerous knocks over the past year. The greatest threat to it has not come from China, the Philippines or Australia, but from the US. Trump’s misguided handling of the refugee issue and his withdrawal from the TPP has combined with external events to place real pressure on the alliance. Trump has cut the tag. Now Australia must think differently about its relationship with the US.